One of the benefits of Corey working at Lowe’s is that he gets to bring home the Build and Grow projects to do with Caleb. Soon as he walks in with one of those sets, Caleb just lights right up. I’m actually really impressed with Corey too. He could build the whole thing by himself in a few minutes, or be too worried he’d get hurt to let Caleb help. Instead, Corey involves Caleb in the whole thing. First Caleb reads him the instructions. Then Corey kind of follows them, but usually has to pull a few parts apart as he goes. 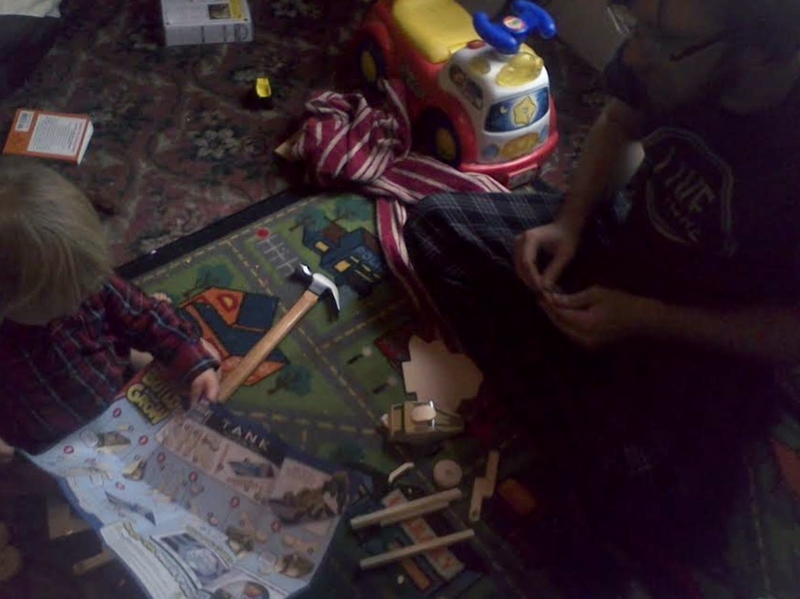 Then he has Caleb help him put in each nail before he hammers it in. Caleb has the option of using stickers, or not. He can put them on and rip them off later. It’s totally Caleb led. In general it’s just a blast watching them, and I know he’s learning just so many things! Putting the little nails in the holes? Totally fantastic fine motor skill practice. Following instructions? Puzzling pieces together? Great brain activities. It’s also education for Corey. Patience, letting go, trust… It’s really beautiful watching them together. Today went better than every other day this week. The big problem I was having is that I hadn’t prepped the “class” before we started. I would set him up with a coloring sheet, and I’d sit besides him cutting and gluing. Of course what mama was doing was SO much more interesting. Frustration would ensue, and it would take a thousand times longer to get everything done, and Caleb would have a harder time getting interested. The big difference today, is I made sure before we even tried to start that everything was ready to go, and we didn’t start at his desk. We sang Old McDonald, and I signed it for him. We went over what a cow was a few more times, and how they live on farms. Then we moved onto the Nursery Rhyme of the week. I made up a little fold book with the characters to “Hey Diddle Diddle.” As I recited the rhyme I pointed out the Cat, Fiddle, Cow, Moon, Dog, Smile/Laugh, Dish, and Spoon. Caleb loved that he had a book to identify the things from. Once we had danced and sung, and he was calm, we moved over to the desk and I pulled out a cow puzzle I made for him. First he had a completed one where he matched the cut out spots to. Then he had a blank cow shape to “add the spots to.” I got the idea for it from a bus version our Families Read instructor made for him. This was a fantastic Fine Motor activity. Placing the pieces, matching sizes… Another thing, which you’ll probably notice is, rather than a normal or round cow, it’s square/rectangle based. I decided on that because of our focus on squares for the week. Speaking of buses and our Families Read instructor… We also worked on this awesome name puzzle today. 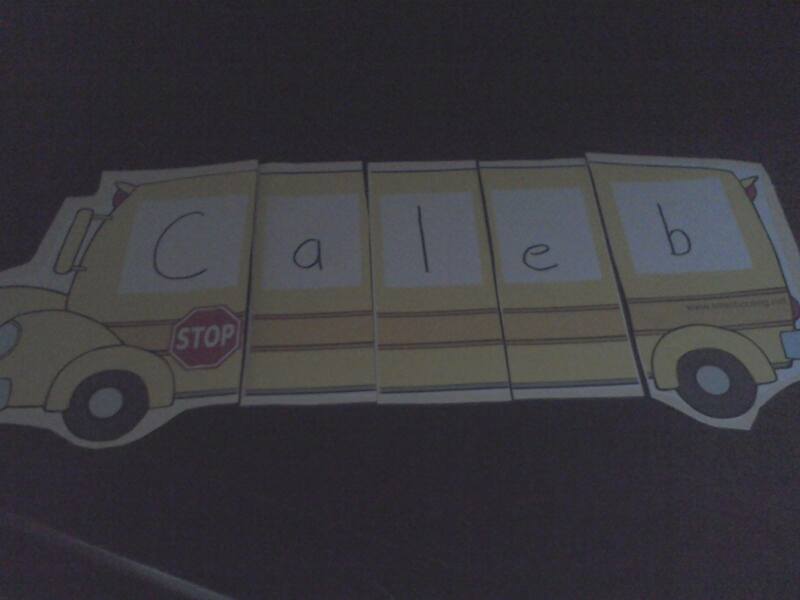 Caleb loves buses, and he’s a big fan of his own name. He liked mixing up the letters and putting them back together. He loves telling us that, “C is for Caleb!” I started by asking him what it said. Imagine my surprise when he said, “Caleb.” This is an awesome example of sight words. Then I pointed to each letter, said the name, and told him to please say it. It was kind of interested. For “A” he said Ah. For “B” he said AB. We repeated the activity a few times, but he kept saying them that way. C, L, and E he had no problem with. Then I mixed them up and just put C and B where they belonged. He took the reigns and put them back in order, though a ended up upside-down. All around it was a good activity for him though. Colors and Counting: Pompom Edition! The Dollar Tree is this magical place where home-schoolers and parents go to buy ridiculous quantities of craft supplies, and educational aids. On one memorable trip I walked by bags of 80 pompoms. I may or may not have grabbed five bags… 400 pompoms seems reasonable right? Right? Now the only question was what to do with these pompoms? Thus the colors, counting, and pompoms game was created! Super simple prep. I took six Styrofoam plates, drew bubble numbers with corresponding circles (aka 2 circles on the plate with the 2, 3 circles on the plate with the 3, etc…), and colored the circles on each plate with a color of pompom. I laid a platter with the pompoms in the middle of the living-room, surrounded by the plates, and Caleb jumped right in. Watching him use his fine motor skills to place the correct color of each pompom on its proper circle was so much fun. We named each color as he put it down, and talked about adding easy numbers. I totally recommend this activity any time. You could put Velcro on the plates and pompoms so they don’t move around so much.Do as many plates as you want, multiple colors, and any size pompoms. There are so many great options and it’s a very low cost activity with lots of “educational areas” being covered. Enjoy! Look at that smile! This was a total win. Yesterday we went to the Dollar Tree, and I finally grabbed water beads. They are in the garden/craft section. They come with a vase, and the two packs I got came with three packs of beads. You soak these beads in water over night and they become little jelly balls. Non-toxic, not sticky, easy to clean up… it’s the perfect activity for kids and toddlers! For us, Caleb is such a water and sensory loving kid that I knew we needed these. He will play in water all day long if we let him, but it ends up with him, my floor, and often me being soaked. These water beads, however, give the feelings of playing in water without actually getting wet. Talking about fine motor skills though, there is a never ending amount of possible activities you can do with water beads. We spent over an hour playing with them when Caleb first woke up today. We started with them in the pub mix container (yay for recycling) where he could reach in just to check out how they feel. Then I grabbed a bowl and asked him to pour some in. I grabbed a little puppy toy, showed it to him, then hid it beneath the beads in the bowl, and asked him to find it. That was fun. Puppy is one of his favorite words. Then he grabbed cars and started driving in the bowl. That was really cool to watch actually. The beads moved like waves and would cover his hands or the car. 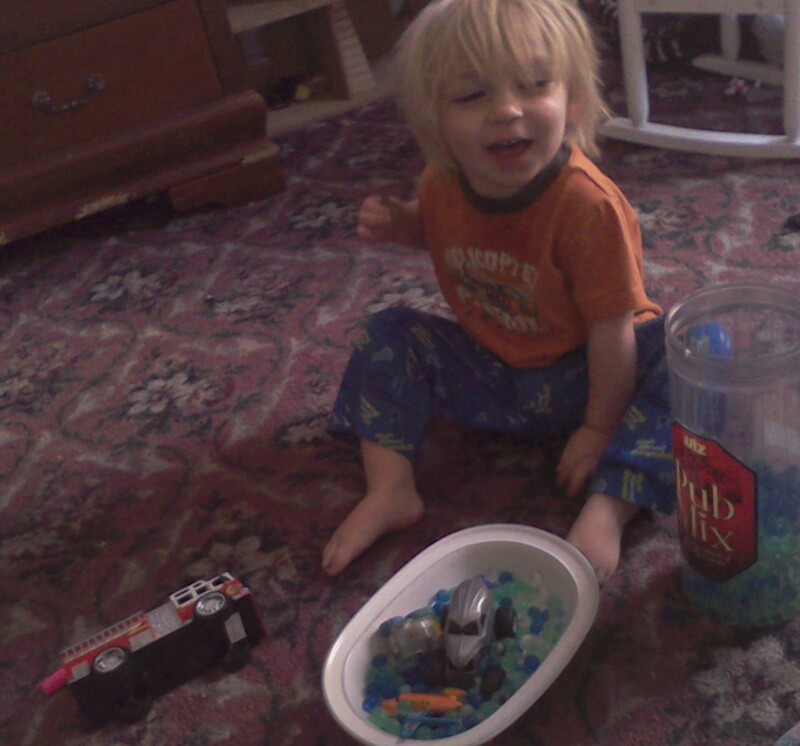 Last but not least, I asked him to help pick the ones from the bowl up and put them back into the container. Talk about fine motor skills. Picking up slippery little balls is hard work! He did great though. I wanted to share a few other activities we are planning with them. One is taking different containers to scoop and transfer the beads with and to. Tubes are a lot of fun. Pour some in one side and have your kiddo at the other end. It’ll be messy, since they’ll bounce everywhere, but so much fun. You can take bottles, with the smaller lid holes, and have your kiddo drop beads into them. 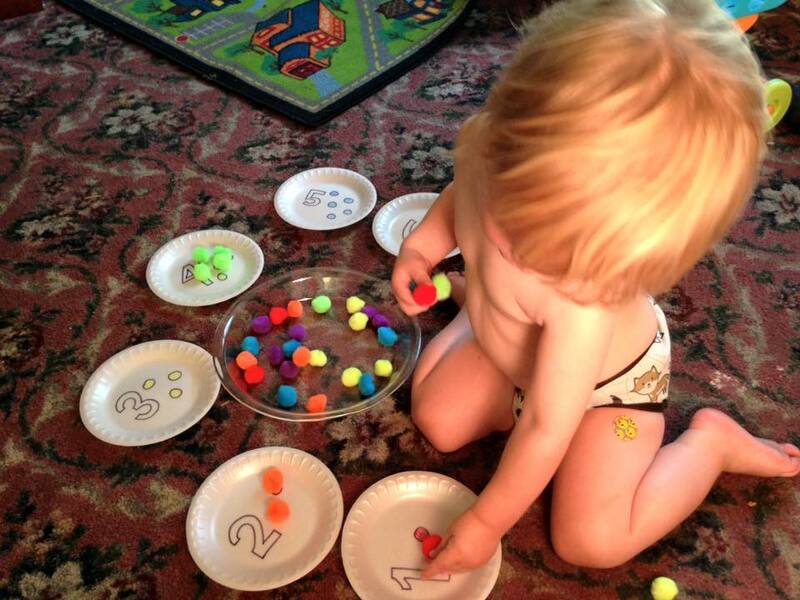 Sorting, counting, working the motor skills… I really recommend having these on hand! Every other Friday Corey and I go to a parenting/parents financial/life skills class, and afterwards Caleb joins us for a play group. Today we read Brown Bear as a group, and then did a few activities the instructor had set out for us. My favorite, and one that Corey and Caleb spent a lot of time on, was painting with cinnamon! It was just a little water mixed with cinnamon. It looked really cool. 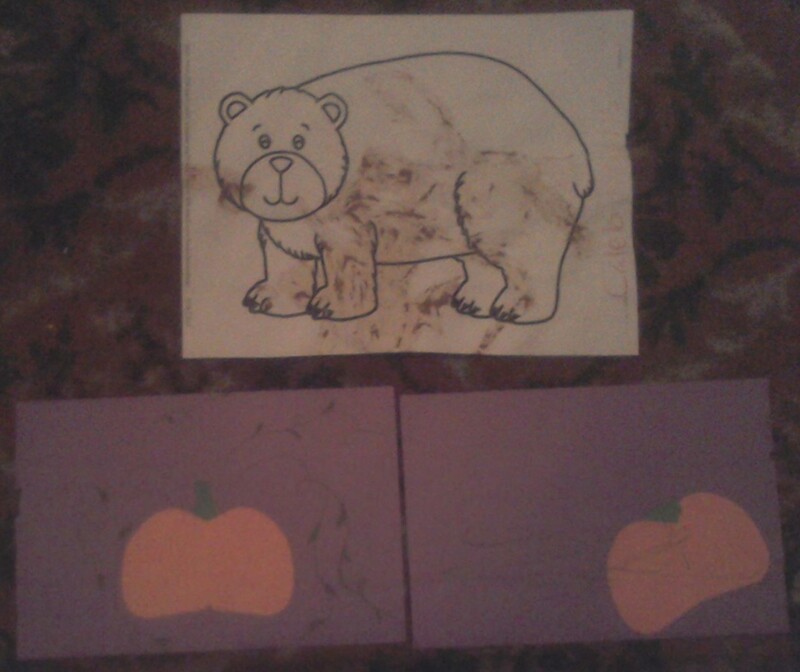 The water turned the paper a light brown, and the cinnamon gave the bear’s fur some really great texture. The best part was how great it smelt. I have a ton of pumpkin spice in my pantry that I’ll be doing this with on a fairly regular bases. The other activity only took a few minutes, but made Caleb very happy. I was working on his curriculum tonight, and that involved a ton of cutting and gluing. While I was working, he asked to help, but I had to say no. As soon as I was finished, however, I threw this second craft together. I ripped a piece of purple paper in half, cut out two pumpkins, two stems, then let Caleb make a few cute in the orange paper left over. While he was cutting, I glued my pumpkin down (the one on the left), and then asked him to do the same. He put glue onto the pumpkin and laid it in the corner. I smoothed it out, and then he glued down the stem. I grabbed us a couple of green markers, and he drew some scribble “vines” on his while I worked on my pumpkin’s vines. Using a paint brush, gluing things down, placing the stem… these are all great motor skill practice. The more things you do, especially with little pieces, the better your kiddo will get at it all. I wouldn’t have thought to let him cut something a few months ago. Now, after watching how careful he is with everything else, I can totally trust him to be capable. I love watching this little man growing before my eyes. I’ve been working with Caleb’s fine motor skills since he was born. Now that he can take directions, and has sharper skills, I’m constantly on the hunt to find new activities for him. This is going to be a short post, because it’s pretty straight forward, but I figured I’d share anyhow. Tonight we dug out the playdough. I started by flattening out a little bit, drawing a C, and handing him a straw. I had my own straw, and I showed him how to use it as a hole punch over the line of the C. This was fun, but the most interesting part for him was making the holes, and the C was quickly forgotten about. Then I remembered the beading activities I’d seen on Pinterest. 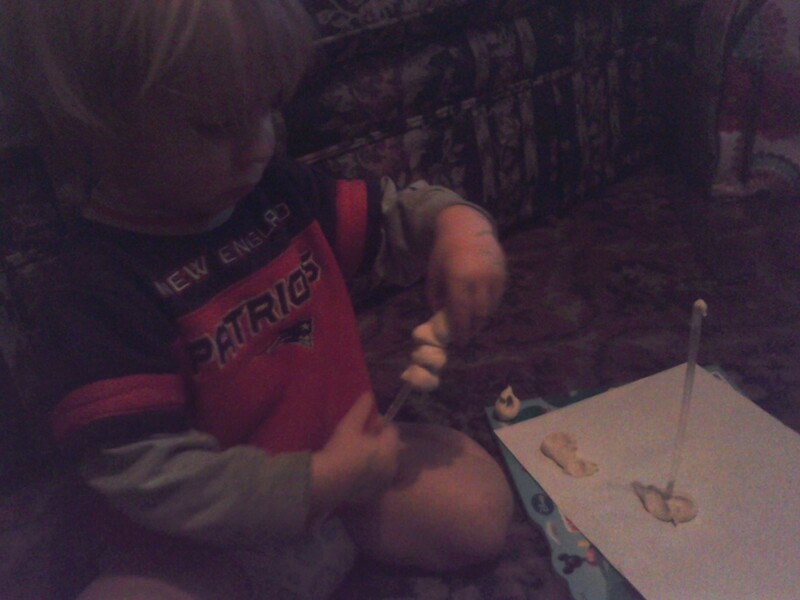 I rolled little balls of the playdough, and showed him how to push one onto the straw. He loved it! He took the straw from me and threaded all of the balls on. A few broke as he pushed them on, but he just flattened them onto the paper, and stuck the other straw into it. All together we spent about thirty minutes on the activity. It was a good way to spend time together, we talked about shapes, we talked about the letter C, and he got good practice for his fine motor skills. I highly recommend this activity! Corey has a slight soda addiction. Very often, aka every day, he runs to 7-11, and brings home his soda, as well as a snack and drinks for Caleb and I, in a drink holder. I’ve been keeping them all pilled up in my pantry for a few months now, because I knew eventually I could use them for something. Last night a friend of mine was telling me her nickname used to be Shelly. This led to a conversation about turtles, and the creation of this craft! Walking by this afternoon, I spotted my pile, and instantly thought, “Turtle shell!” I grabbed a bunch of green, orange, and yellow markers. Caleb and I sat on the living room floor going to town on the drink holder. 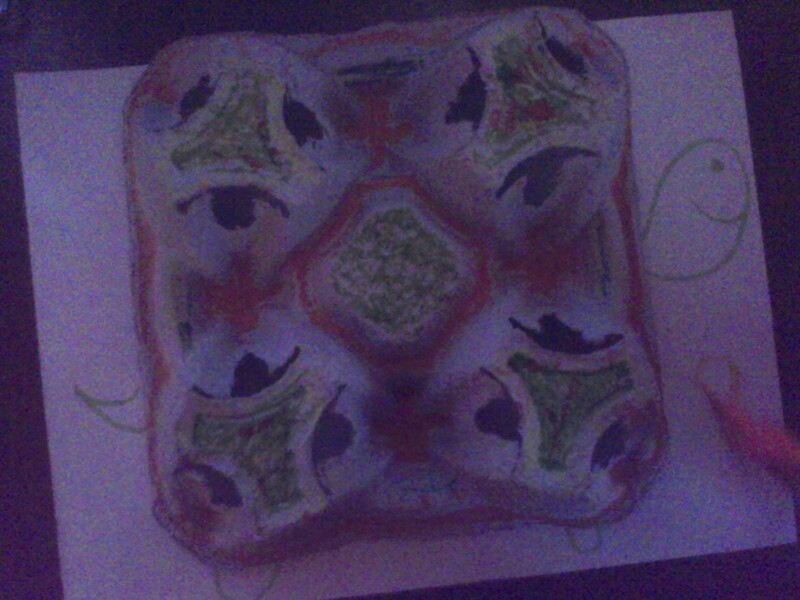 I colored one of the triangles green, and he copied. Then I outlined everything in different colors, and had Caleb cover everything else in his cute multi-colored scribbles. He really went to town on it and I’m completely in love. 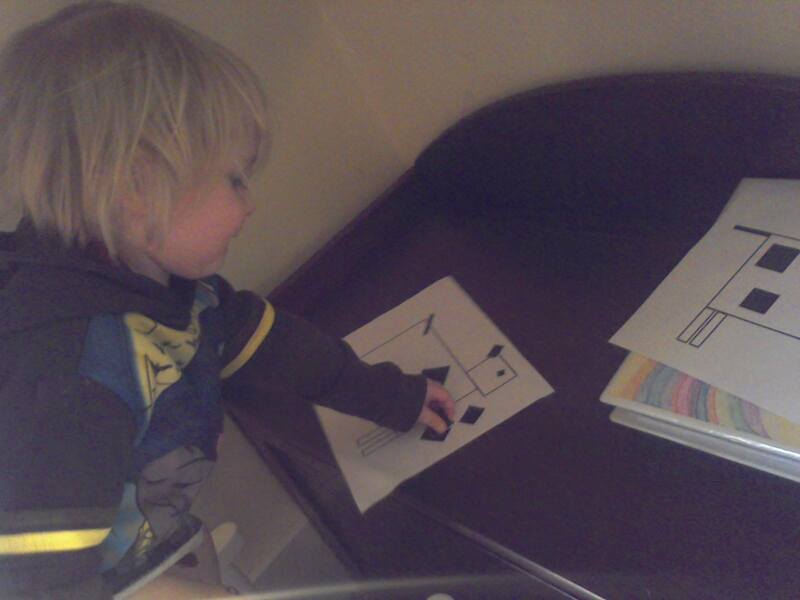 He learned about some pattern recognition, we talked about colors, and I told him about turtles while we colored. Once the shell was done, I just grabbed a piece of paper and drew a quick head, tail, and legs onto it. I’m sure one of you awesome readers can do something even better with it, but Caleb was anxious to rip the cup holder apart. There was a little rip, and he had started picking at it. I asked him if I could get a picture first, and he said, “Okay mom. One.” After I handed it back he ripped it to pieces, and then colored more on the pieces. Silly, silly little boy. Let me know if you try this! It was a ton of fun for Caleb and me. I think the next craft will be turning one into a cow.